I love the way this film turned out! This was the first film I made to test the Stop Motion Pro software I won in the Brickfilms Historical Fiction Constest. It was also my first go at widescreen filming as well. This whole film developed from an image I had imagined, a minifig standing in a white expanse in front of a door. I initially had no idea how to get to that image through a logical narrative, or, where to take it. The filming took about a day and a half, with most of the filming occuring on the first day so I could keep the lighting as constant as possible. I'm still unsure about the plot, I've no idea what it means, but it has a certain logic to it, and is recursive in nature. 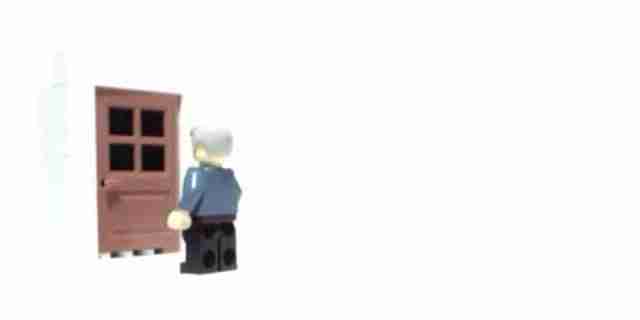 The intention being that this being just one little snippet of minifigs jumping through many doors. Inspiration: When I watch Doorway I see two main influences: The Matrix and all the doors from Monsters Inc. but as I was filming I wasn't even thinking about these things. My favourite moment in this little film is when the camera pans right around the door and thenfocuses on the main guy. This bit was fun to film and turned out much better than I had hoped for. Another thing I was really focusing on with this one was the sound, I love the sound of the wind throughout. I'm pretty happy with the use of widescreen, it allowed me to play with shots in a much more creative way, and in a way makes the expanse seem larger. It was also very useful for allowing me to hide all the support plates below, so that there is much more of an impression of just white.